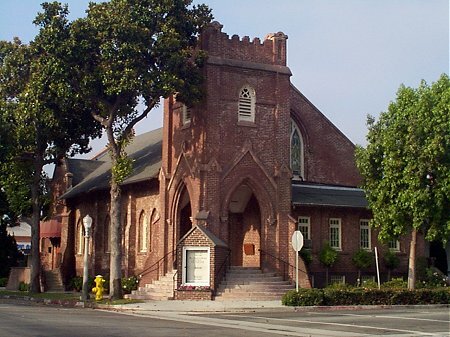 An impressive Gothic Revival structure, this masonry building is the oldest remaining church in Fullerton and has served the needs of three different congregations. The Methodists erected the church in 1909, at a cost of approximately $20,000. When the Methodists built their present church across the street in the late 1920s, they sold this property to the Seventh Day Adventist Church, which occupied the church until 1964. The Methodist Church took ownership a second time, with the intention of demolishing the building to use the property as a parking lot. That endeavor proved too expensive, so the property was again sold, this time to the First Church of Religious Science. The church exhibits many features reflecting the New England roots and the British heritage of the Methodist minister who commissioned the construction of the building. The church is set close to the street, and a decorated three-story square tower caps its raised corner entry. Other defining features are the pointed arched windows and entryways, engaged buttresses, and the detailing with brickwork. The reddish-brown brick used in the construction of this structure were handmade by the Simons Brick Company of Los Angeles. These distinctive bricks, each bearing the Simons stamp, are noted for their superior hardness and were used to construct innumerable Los Angeles-area institutional landmarks and residences. This structure is the only building in Fullerton built with bricks from the Simons Brick Company. Many of the original Gothic-style appointments and decorative elements of the interior are intact. Among several stain glass windows throughout the church, two feature the use of opalescent glass, noted for its deep, rich coloring. These are the large 10' x 12' icon on the sanctuary's west side and the north-facing window that is composed of three separate stained glass arches. The church's interior layout is based upon the auditorium-style Akron Plan. 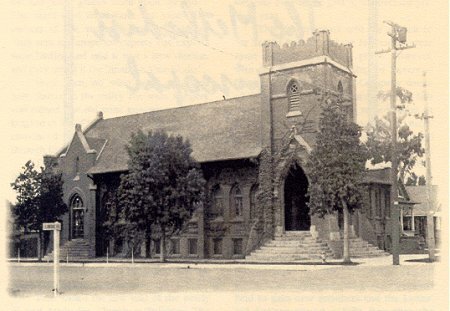 Although the Akron Plan had become the standard for the Methodist and other Christian denominations by the 1890s, this layout was not used in Fullerton until the construction of this church. This structure was designed by famed Los Angeles architect Albert R. Walker. Walker designed many notable buildings in Los Angeles in the first half of the 20th century. The First Methodist Episcopal Church was one of Walker's first commissions and represents one of only a handful of structures that he designed before forming a series of partnerships with other architects. Since its acquisition in 1967, the First Church of Religious Science has faithfully restored the building. In 1987, the Whittier Narrows earthquake caused extensive damage. Within three years the church completed the work to retrofit and repair the building at cost of over $500,000. The Northridge earthquake in 1993, however, again damaged the tall brick chimney on the west side of the building, and the decision was made not to rebuild it. © Copyright 2010-2019 Fullerton Heritage. All rights reserved.